Algae cultivation scale-up continues at the Synthetic Genomics Imperial Valley facility just outside Calipatria, California. ZIVO management had contracted with Synthetic Genomics, Inc. (SGI) in early December 2016 to begin an integrated commercialization program. 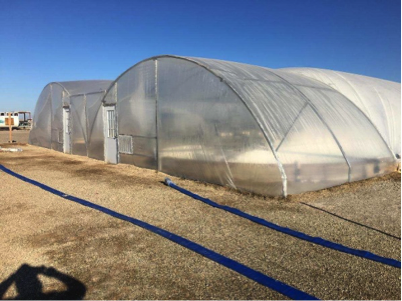 The first step was to transfer viable algae from the Company’s ponds and panels at the Arizona Center for Algae Technology & Innovation (AzCATI) to SGI’s laboratory and greenhouses in La Jolla, California for first-round culture amplification and cultivation benchmarking. 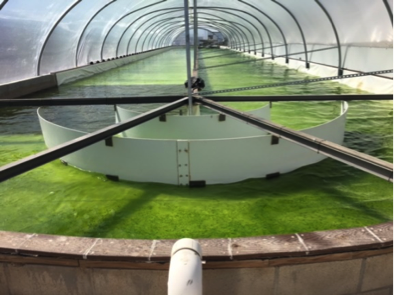 Once that amplification was successful, the algae was transferred to SGI’s Imperial Valley facility for scale up, beginning with 1000 liter ponds, and then as the algal biomass continued to increase, sequentially up to 80,000 liter ponds. Beginning this week, harvesting is now underway, with biomass being delivered to Pulse Combustion Systems in Payson, AZ for spray drying. The dried biomass will then be subjected to a battery of tests performed at various labs around the country to measure nutrient levels, vitamins, bioactivity, bacterial content, metals, endotoxins and other parameters as part of the FDA compliance process, before being used for the long-term toxicology study required for GRAS certification as a food, beverage and feed ingredient. 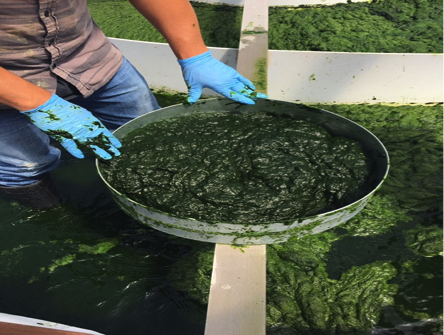 As part of the integrated commercialization program, SGI has commenced full genome sequencing of ZIVO’s algal strain to establish a baseline for intellectual property claims, and on May 1 will commence a strain development program to optimize for rapid growth, yield and heat tolerance. In related news, ZIVO and NutriQuest, an innovative leader in animal health and nutrition solutions, have executed a joint product development/licensing agreement to bring the ZIVO’s processed algal biomass and natural extracts to market as a livestock and poultry feed ingredient. The first step, a broiler study to begin understanding the full potential value of ZIVO feed ingredients, is already underway. Covered ponds protect against windblown sand and invasive organisms. Courtesy Synthetic Genomics, Inc. The Company’s trademarked “Kalgae” biomass lends itself to different cultivation methods, especially traditional pond production. Courtesy Synthetic Genomics, Inc. The Company’s proprietary algae forms a thick, frothy mat during daylight hours. Courtesy Synthetic Genomics, Inc.